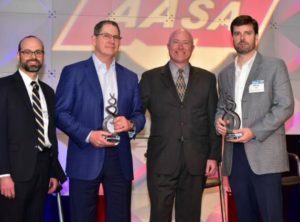 From left, Paul McCarthy, AASA executive vice president and MEMA senior vice president; Joe Pase, IT executive director, Tenneco; Scott Thompson, senior vice president, automotive and business services, Epicor; and Fletcher Lord III, PWI vice president. The first-ever Channel Excellence Award was taken home by Tenneco and Parts Warehouse Inc.
A shared data analytics program between the supplier and distributor focused on inventory and sales optimization of Monroe ride control components and won over the selection committee of the award from the Automotive Aftermarket Suppliers Association and sponsored by Epicor. The award was created to recognize innovation and encourage collaboration between suppliers and valued channel partners to drive aftermarket growth. For Tenneco and PWI, the initiative started in April 2018. Tenneco analysts noticed that PWI’s strut assembly sales were under indexing against market demand in its service areas. Leaders from PWI, which is a member of the Aftermarket Auto Parts Alliance, met with sales reps and member of the data analytics team from Tenneco to come up with a collaborative inventory analysis and repositioning to grow PWI’s share of the strut assembly category, reduce lost sales and improve margin performance. Using shared data and analytics extensively, the project was completed in August. “Upon implementation of the resulting stocking strategies, PWI immediately experienced significant, sustained improvements in out-the-door sales, average unit sale, inventory turns and market share,” said Fletcher Lord III, PWI’s vice president. “We relied on Tenneco’s category expertise and proprietary market intelligence combined with an uncommon depth of insight provided by PWI and the Alliance headquarters team,” said Tenneco’s IT executive director Joe Pase. They were up against the teams of Brake Parts Inc./Genuine Parts Co. and Gates Corp./XL Parts as finalists. Videos from each finalist were played prior to the announcement of the winner at the 2019 AASA Vision Conference in Detroit.